For those, alas, who still don’t know, Dragon Ball (ドラゴンボール)is a manga written and illustrated by the very famous Japanese designer Toriyama Akira 鳥山明 (also the creator of the manga and anime Dr. Slump and Arale), originally published in installments in the famous magazine Weekly Shonen Jump around 1984, with weekly episodes. The manga was then adapted into two well-known anime series, Dragon Ball and Dragon Ball Z, broadcast on Japanese television since 1986, produced by Toei Animation, a famous Japanese animation studio. Later two sequels were made, Dragon Ball GT and Dragon Ball Super (still on the air), as well as a few animated films (they’re already up to 19!) and a sort of a remake of Dragon Ball Z, called Dragon Ball Kai which, essentially, is a correct and revisited version of the Z series. As was already said, from its first release, Dragon Ball has become one of the most famous manga and anime series worldwide of all time, not to mention the second greatest in sales, with more than 200 million copies, after the very popular pirate series, One Piece. Amazingly, the greatest and best known mangaka 漫画家 (masters of Manga) of all time – Eiichiro Oda (One Piece), Masashi Kishimoto (Naruto), Tite Kubo (Bleach), Hiro Mashima (Fairy Tale) – have cited Dragon Ball as a source of inspiration. These mangaka have in turn created insane manga / anime, just think of One Piece and Naruto to get an idea. Innumerable video games, table games, card games, and Dragon Ball figurines have been produced and, in the ten years between 1995 to 2005, Dragon Ball was the second most searched term on internet search engines! And think about it, even today there are tons of people that get tattoos on their bodies with Dragon Ball designs (Vegeta is by far the most popular tattoo among men and women!). Not to mention the thousands of cosplays (the practice of putting on a costume of a known character in a specific setting, like the “nerd holidays” periodically held in Japan) of Dragon Ball. Basically, Dragon Ball was and continues to be a cult, a masterpiece that everyone should see some time in their life regardless of their age. To write a brief plot review of Dragon Ball is a hard, and in my opinion, “illegal” undertaking, that positively cannot do justice to the magnificence of this manga / anime (can you tell I’m an avid fan? ), but I have to do it just to give an idea of what we’re talking about. Dragon Ball centers around the story of Son Goku 孫悟空, a child with a monkey tail and extraordinary powers. It all begins with Goku meeting a young girl called Bulma. This girl was searching for the seven spheres of the dragon (the Dragon Balls) which, if reunited, will make a green dragon appear, Shenron, able to grant almost any desire requested, even immortality and the ability to bring back the dead (how many times has he helped the good Crilin…). Noticing Goku’s strength, the physically weak but very astute Bulma, manages to persuade Goku with trickery to accompany her in her voyage to seek the seven spheres of the dragon. 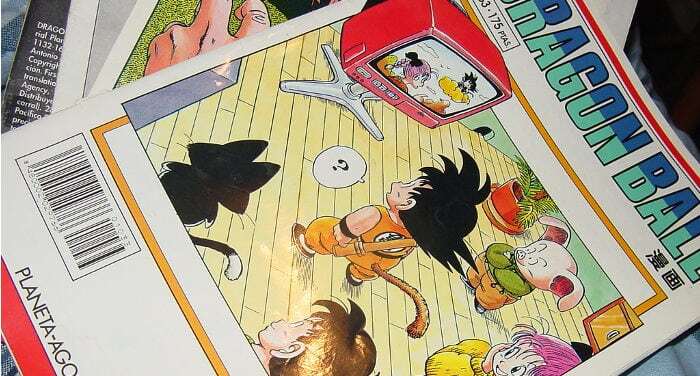 This is how the two come to leave together on a very long journey, in which they will meet a series of characters that will help Goku in his growth and formation. But Goku won’t just find friends, but even enemies that he’ll have to defeat from time to time to stop them from accomplishing their wicked plans. In all this he makes an appearance in a Tournament of Martial Arts that is held every three years. When Goku grows, he discovers that he’s part of an extraterrestrial race, the Sayan, a cruel race of warriors and conquerors of planets who sent him to Earth when he was still a newborn so as to conquer it. As chance would have it Goku bangs his head as a child and loses his memory. Moreover, he is raised by Son Gohan, a valorous Earthling with a very good soul that’s an expert in martial arts. After discovering that he’s a Sayan, Goku ends up saving his own planet from enemies that mostly come from worlds far from the Earth, so the scope of the setting expands more and more until including worlds very distant from the Earth. Goku’s strength will grow exponentially as will that of the enemies that he meets from time to time. 1 – The word Sayan, comes from the Japanese saiya jin サイヤ人 which is an anagram of yasai 野菜 which means “greens/vegetables”. So we find the Sayans, a “green” people, in fact we find Vegeta which comes from “vegetable”, Radish which comes from radish, Nappa which comes from “green salad”, Burdock (Goku’s father) which comes from Arctium Lappa, an herbal plant. But we see other Sayans: Broly comes from “broccoli”, Paragas (Broly’s father) comes from “asparagus”, Kyabe (the Sayan of Universe 6 of Dragon Ball Super) comes from “cabbage”. Staying in Universe 6, the counterpart the planet of Sayan, Vegeta, and the planet Salada, in Japanese means “salad”. 2 – Among the main characters we find many names that come from foods particularly Chinese dishes! We have the Kuririn (Crilin) which means “chestnut” (doesn’t Crilin look a little like a chestnut? ), Tenshinhan 天津飯 (rice seasoned with crab meat if I’m not mistaken), Yamcha (a particular type of rather bitter tea), Chaozu which comes from Jiaozi 饺子 (dumplings), Oolong (we know it as Pu’er) which is a type of tea, Oolong Tea, Pilaf which is a type of rice, while his thugs, Shu and Mai, if put together become Shumai a type of steamed Chinese dumpling. To conclude, Gohan would be “Cooked rice” (ご飯). 3 – The Ginew team is composed of, ギニュー　Ginyuu (Milk); リクーム Rikuumu (Cream); バータ Bata (Butter);　チーズ chiizu (Cheese); グルド Gurudo (Yogurt). 4 – Freezer’s family: Freezer (refrigerator), Cold (cold), Frost (frosty). 5 – Cell and Majin Bu: Cell comes from セル Seru (cell), Majin Bu comes from Bippity Boppity Boo (the wizard that created Majin Bu is called Bibidy his son Babidy). 6 – We also see some divinities: The Supreme (in reality it would be the “God” but the name was changed due to affairs tied to our religion), in Japanese it would be Kami 神; Shenron would be the “Dragon God” 神龍; Kaio (not King Kaio) would be “God of the Worlds” 界王; Kaioshin would be “God of the Kings of the Worlds”界王神; Zeno would be “the King of Everything” 全王; while Beerus and Champa (the divinities of destruction) would respectively be “Beer” and “Champagne”, their masters Whis and Calvados would respectively be “Whisky” and “Calvados” (a French wine). There are some small curiosities of Dragon Ball that are surely worth three minutes of reading. Why does the Genie of the Turtles (The master Muten) live in a Hawaiian style house and where a Hawaiian shirt? Where does the energy wave come from (the Kamehameha wave, to be clear)? The great master and designer of Dragon Ball, Toriyama Akira is a fan of Hawaii and, whether you believe it or not, Hawaiian history! The name of the Kamehameha comes from nothing less than a dynasty that ruled the Kingdom of Hawaii from 1810 to about 1893. Rumor has it that Akira thought of another protagonist other than Goku. Do you know who? Well… BULMA! At least he changed his mind! Akira was also a fan of Cinderella, in fact as we saw above, Majin Bu comes from Bippity Boppity Boo which comes from Cinderella. Majin Bu’s appearance would be an homage to Bib Fortuna, from Star Wars. Remember (King) Kaio’s monkey, Bubbles? That too was a homage, but who? Michael Jackson’s monkey who was called Bubbles! A last curiosity (that hasn’t been confirmed): Dragon Ball should have ended with Freezer, the top villain; in fact, in Dragon Ball Super (spoiler alert!) Freezer not only returns but also takes on a very important role and according to me will be the final enemy of Dragon Ball Super!! Not many know that the good Toriyama Akira, for his masterpiece, was inspired by one of the four great novels of the Chinese Ming era, the xiyouji 西游记 (Memories of the Voyage to the West) translated in Italian as “Lo Scimmiotto”, written by the Ming era scholar, Wu Cheng’En 吴承恩. Nevertheless, the attribution of this work to Wu Cheng’En is still in question since the novel was published anonymously. This great novel of classic Chinese literature recounts the journey and adventures of a Buddhist monk called Tripitaka, giving it a mythical and magical tone, inspired by a real person the monk Xuanzang 玄奘. The monk Tripitaka, in the novel, was sent by Guanyin 观音 (She who sees voices) to India Buddhist sutras not available in China. In his journey to the west (heading for India, at the time called Foguo 佛国 “Land of the Buddha”), Tripitaka is accompanied by three disciples, the monkey Sun Wukong 孫悟空 (where the character Goku comes from), the pig Zhu Bajie 猪八戒 (where the pig character of Dragon Ball comes from, Puar) and the river demon Sha Wujing 沙悟净. During their walk they have to defeat monsters and demons. The monkey Sun Wukong is a rather interesting character. Born from a rock, Sun Wukong leads the monkey people in a sacred cave becoming king of his people; worried that someone might blow away what he conquered, he undertakes a voyage to the house of a wise man (like the wise master Muten of anime / manga) who teaches him how to reach the Way of Dao 道. To keep it short, Sun Wukong reaches a level of incredible power, obtains a cloud that’s able to fly (in anime / manga this cloud is known as Speedy Cloud), as well as a staff that’s able to expand and retract at will. The Jade Emperor, worried about Sun Wukong, invites him to his palace to keep him under control, but it is there that Sun Wukong will find and eat the Fish of Immortality, becoming immortal and invincible. He’s eventually sent to the Tripitaka as a guard. The figure of the monkey is quite famous in China, and also merchandised to the max. Gadgets, statues, films monkey TV show series pop up profusely. Imagine how it was to be in China during the year of the monkey (2016)! The monkey is also a very visible character for its acrobatics in the Beijing opera, Jingju 京剧, where they usually perform dressed in yellow and carrying a cane that they use in their acrobatics. I really hope you liked this article!